Death certificate for Francis Olme Cook, May 10, 1865 - March 13, 1931. Francis was a daughter of Antonio (Antoine) Olme, who was born either in France (per 1910 U.S. Census) or in Belgium (per this death certificate); and Florida Parker, a California Indian whose heritage we do not yet know. Soon after her 14th birthday, on May 30, 1879, Francis married Mr. Dolores Cook, whose mother was a California Indian born at Mission San Gabriel (Tongva?). In 1882 the couple moved onto a quarter section of land — a quarter section is usually 160 acres — in Castaic. Dolores Cook, who worked for Castaic land baron William Jenkins, was murdered in 1890 by two of Jenkins' rivals. Less than three months later, Jenkins swindled the widow Francis Olme Cook out of her Castaic land. Francis had at least two brothers, Joseph and John Olme. Francis and Dolores had two sons, Theodore and Frederick S. Cook(e). According to the obituary below, they also had a daughter, Valentine, who married a Biscailuz. Sometime after selling her land to Jenkins, Francis moved into the household of her younger son Fred in Castaic. Fred was married to Chief Frances Garcia (Cooke), who descends from Tataviam Indians who lived at Chaguayabit/Tsawayung village, aka Castaic Junction, prior to European contact. The certificate gives her name as "Francisca (Cook) Garcia." We don't really know why. It could relate to the fact that the elder, Chief Ysidoro (Isidore) Garcia (father of Chief Frances), also lived in the Fred and Frances Garcia household. Her death certificate says Francis Olme Cook was married at the time of her death, but it lists her spouse as "unknown." It doesn't show the identity of the informant for the certificate. Sometime between 1910 and 1931 the Fred and Frances Garcia family moved to Newhall. 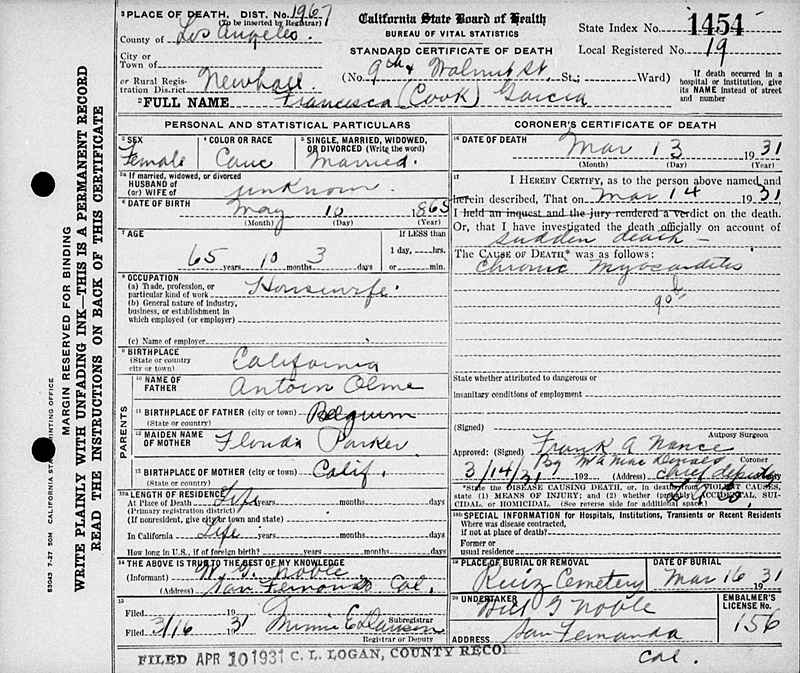 Francis Olme Cook's death certificate states that she lived her whole life at Walnut and 9th streets in Newhall, where she died from heart failure. As noted, that is not quite accurate. Undertaking services were provided by Noble of San Fernando. Francis Olme Cook was buried March 16, 1931, in the Ruiz-Perea Cemetery in San Francisquito Canyon. Old Resident Goes to Last Home. The Newhall Signal | Thursday, March 19, 1931. Mrs. Francesca Cook died suddenly, Saturday morning, March 14, at the home of her son, Fred Cook, on Walnut Street. The funeral was held Monday morning at the Catholic church, in charge of the pastor, Rev. Father Dwan. Interment was in San Francisquito cemetery, north of Saugus. Francesca Ohlme was born in Los Angeles in 1866. She was married to Dolores Cook when she was sixteen years old. 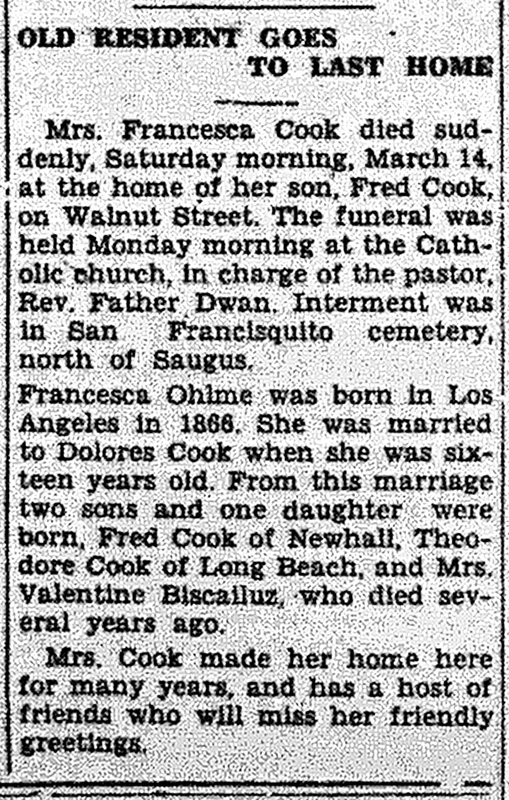 From this marriage two sons and one daughter were born, Fred Cook of Newhall, Theodore Cook of Long Beach, and Mrs. Valentine Biscailuz, who died several years ago. Mrs. Cook made her home here for many years, and has a host of friends who will miss her friendly greetings. Webmaster's note: Obituary as published; no corrections or revisions made here. TLP3101: 19200 dpi jpeg courtesy of Tricia Lemon Putnam.